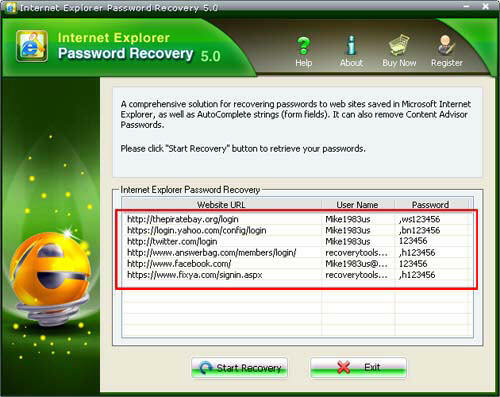 Tips: Below are the steps to recover passwords for web sites saved in Microsoft Internet Explorer, as well as AutoComplete passwords. 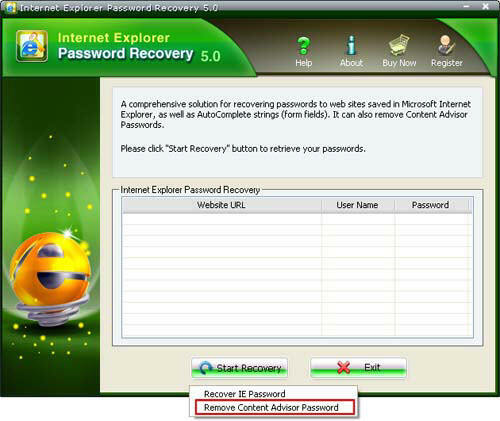 Internet Explorer Password Recovery 5.0 can also remove Content Advisor passwords. To see the detailed information, please refer to the "Help" document integrated in the program. Step 1: To get a list of all passwords you have saved in Internet Explorer , press "Start Recovery" button and select "Recover IE Password" menu item. Step 2: That window shows the following columns. Website URL: Just the address of the site. Please note that it is NOT the full URL, but just the "root" of the site; the actual URL is not saved in the system at all, and so it cannot be retrieved user name. It is the user name with which you use to log in the web site. The password is required to log in a certain password-required web site or web page. 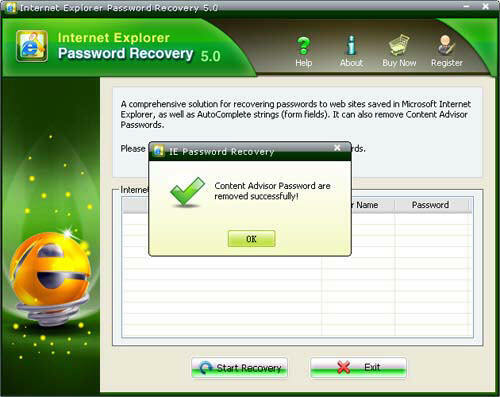 Step 1: To remove Content Advisor passwords , press "Start Recovery" button and select "Remove Content Advisor password" menu item. Step 2 : Remove Content Advisor passwords successfully.